SLOW (Silence Lives Out/Over Whirlpools) is a Belgian Atmospheric Funeral Doom project featuring Deha (WE ALL DIE (LAUGHING), IMBER LUMINUS, etc.) and Lore B. (TER ZIELE). This release, IV – Mythologiae, is a re-release, that due to a data loss, required all voices and drums to be re-recorded. Additionally a new track, “The Break of Dawn” was recorded and added to this special revamped edition that also features new mixes and new additional artwork. The band/project itself was initially formed in 2007, and should be considered the forefather to the Funeral Doom genre and subsequent bands of the genre such as BELL WITCH. This album is a pure artistic endeavor. One that’s stunning in its overall beauty, and haunting and shocking in its ability to induce fear and dread. It’s quite the contrast, yet one that struck me quite deftly to my core. Deha’s vocals at times are as ‘Doom’ as anything I’ve heard, and combined with the atmospheric soundscape of music, I can guarantee it’s like nothing you’ve experienced before. I found it to be an album worthy of additional listens in a variety of moods, situations and methods. Each listen raised a range of emotions within me, and ultimately lest me emotionally drained, but surprisingly content. “The Suffering Rebel” does a fine job of reflecting the entirety of ideas and concepts behind this collection of songs. Beginning dark and suggestively evil, the song briefly flitters about with a lightness, perhaps a ray of hope, before returning to the shadows and murkiness of obscurity. This contrast , ever so brief, is what causes SLOW to stand apart from other bands of the genre. It’s as breathtaking in its simplicity, as it is seductive in its secrets. As a listener, just when you think you’ve figured out a pattern, or a formula, the music takes a turn to an unexpected corner of the cathartic range of emotions you’re experiencing. It is a lot to take in and try to contextualize, but somewhere within, I expect I’ll finally find the key. I hope so at least. I want to know what is on the other side. The newly recorded “The Break of Dawn” manages to fit within this existing puzzle like it was always there. The track manages to bring a sort of closure to the earlier tracks, while sharing the same intensity and contrast of darkness and light. Often newly recorded tracks seem to be just that; an afterthought, or a hasty addition of a throwaway song or B-side. Nothing seems further in this case. This track is a living, breathing part of the original concept, and masterfully executed. 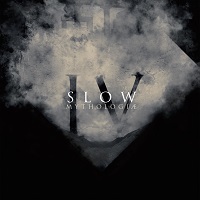 SLOW have taken a great release, and made it even more substantial and vital. Any fan or casual listener for that matter, of the Funeral Doom genre should possess a version of this album. As BLACK SABBATH is to Doom, SLOW is to Funeral Doom. As Vol. 4 is to Doom, IV – Mythologiae is to Funeral Doom.